In Mothers’ Support Groups, trained mentors counsel HIV-positive pregnant women and mothers on optimal child-rearing practices and encourage them to adhere to PMTCT programs. Photo courtesy of Julia Sherburne. The following is the second in a three-part series of I-TECH success stories from Ethiopia. In Ethiopia, only 24 percent of HIV-positive pregnant women receive antiretroviral therapy (ART) to prevent transmission of the virus to their children (UNICEF, 2012). The importance of counseling for these pregnant women is critical to increase treatment rates and ensure more children are born HIV-free. 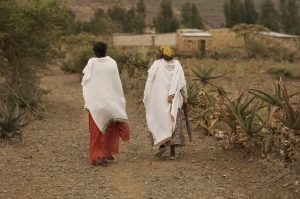 In 2009, the International Training & Education Center for Health (I-TECH), with support from the U.S. President’s Emergency Plan for AIDS Relief (PEPFAR), began managing support groups for HIV-positive pregnant women and mothers in three regions of Ethiopia: Axum, Gondar, and Dubti. This case management program, which came to a close at the end of 2014, was the first of its kind in the country, training a group of 63 mentors to counsel pregnant HIV-positive mothers on optimal child-rearing practices and offering psychosocial support to help them adhere to prevention of mother-to-child transmission (PMTCT) programs. Yirgalem Taye is one of the trained mentors from the Mother’s Support Group based at St. Mary’s Hospital in Axum, Northern Ethiopia. Alem Tsehaye sits by a bowl of smoldering frankincense while playing with her 7-month-old baby girl, Heyab. In 2009, Alem tested HIV-positive, forcing her to change her plan to move abroad and work as a domestic servant. In 2013, she became pregnant, which caused anxiety about the well-being of her child. She enrolled herself in the Mother’s Support Group at St. Mary’s Hospital and started to receive counseling. One of the biggest challenges facing a woman diagnosed with HIV is disclosure to her husband. If a person with HIV status fails to make a disclosure to his or her partner, the uninformed partner becomes a risk to home and community health. One role of a Mother’s Support Group mentor is to mitigate this risk by encouraging group members to inform their partners so that they can be tested without delay. From 2009 to 2014, nine hundred mothers were enrolled in the mentorship program at Gondar University Hospital. Out of those 900 births, only 72 infants – or 8 percent – tested HIV-positive. The World Health Organization estimates that, in the absence of any intervention, transmission rates can range from 15-45 percent. Outside the Mother’s Support Group ward at Gondar University Hospital is a courtyard where a group of young mothers sit doting over their babies. Many of these mothers do not have an appointment but have come to see their mentors. The I-TECH program may have come to an end, but the Mother’s Support Groups are acknowledged for their comprehensive service delivery and for their successful efforts to reduce the number of HIV-positive babies born in Ethiopia – and to increase the productivity and well-being of HIV-positive mothers. Helen Alebachew has two children. In 2007 she discovered her HIV-positive status after undergoing a test while suffering from tuberculosis. She says she benefited from learning about HIV-friendly family planning practices and coping strategies within the group.